Outfit your restaurant or catering service with this Avantco S30 11 qt. wet heat soup warmer kettle! This kettle features an 11 qt. capacity so you can hold large quantities of soup at a time. With 400W of heating power, this soup warmer is great for keeping your soups and sauces at the perfect serving temperature. 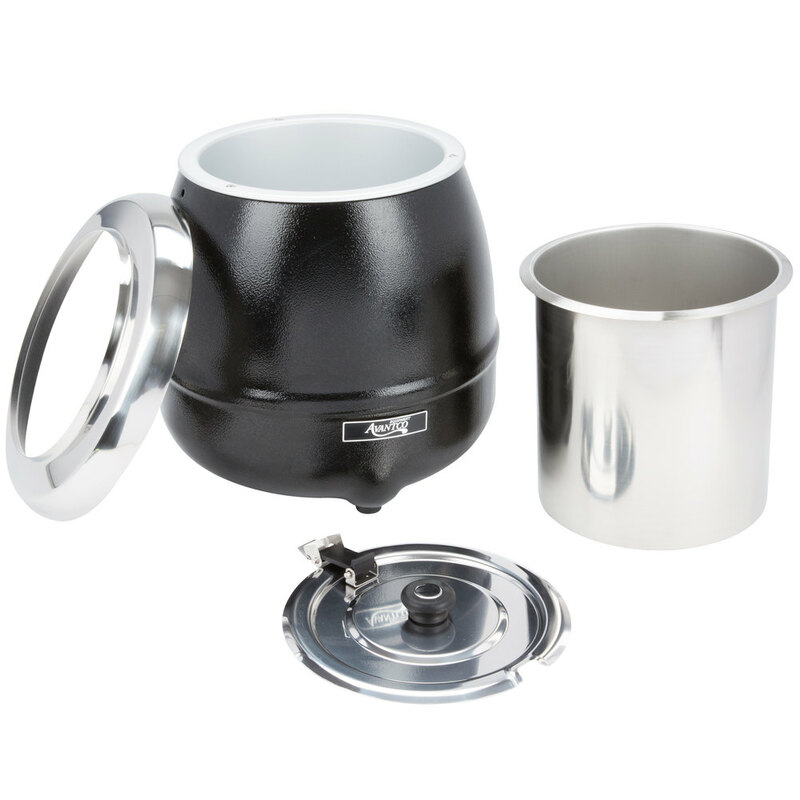 The adjustable temperature knob makes it easy to control the heat inside the kettle, while the hinged lid features a knob so it can be easily opened by your staff or customers. 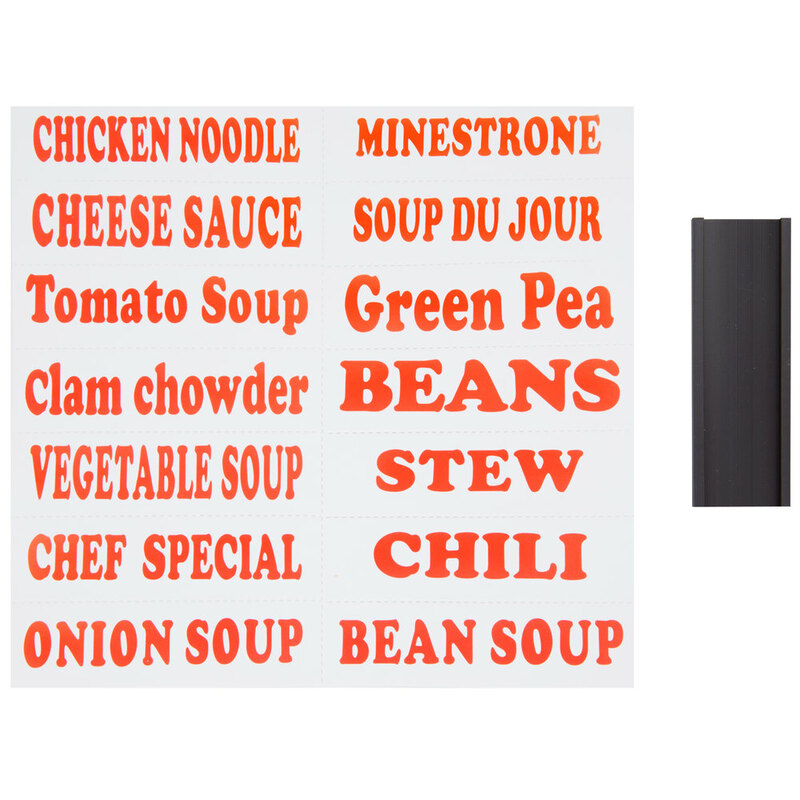 Also, the included soup labels make it clear to your customers what you're selling. An stainless steel inner liner and stainless steel pot ensure long-lasting durability, and thanks to its neutral color, you can be sure this kettle will complement your business's decor while providing quality products to your valued customers. Perfect size for my mobile food cart business. It keeps soup at the perfect temperature to serve immediately, I have had nothing but good reviews from customers. May need to buy another one. GREAT WARMER! EASY TO CLEAN. KEEEPS SOUP AND PORRIGDE VERY HOT. I LOVE IT AND I HIGHLY RECOMMEND THIS POT FOR ANYONE LOOKING TO SERVE HOT SOUP, I WOULD PURCHASE AGAIN. Did the job nicely. Kept a good amount of soup hot but didn't overheat it. Looks decent and doesn't take up a lot of space. The only thing that was mildly irritating is that you have to remember to check the water level; it does evaporate more quickly than others I've used. But overall, you can't beat it for the price. I've had my kettle for a couple of years. It gets the job done. Great for soups, chili, cheese or anything that you need to keep warm. I didn't know what to expect since I ordered these online and couldn't see them but I was more then please when they came! They work great. This is a new affordable addition To my catering business. Works great for soup and or chili. There is the temperature setting to serve it just the way you like it. The Avantco S30 11 Wt. 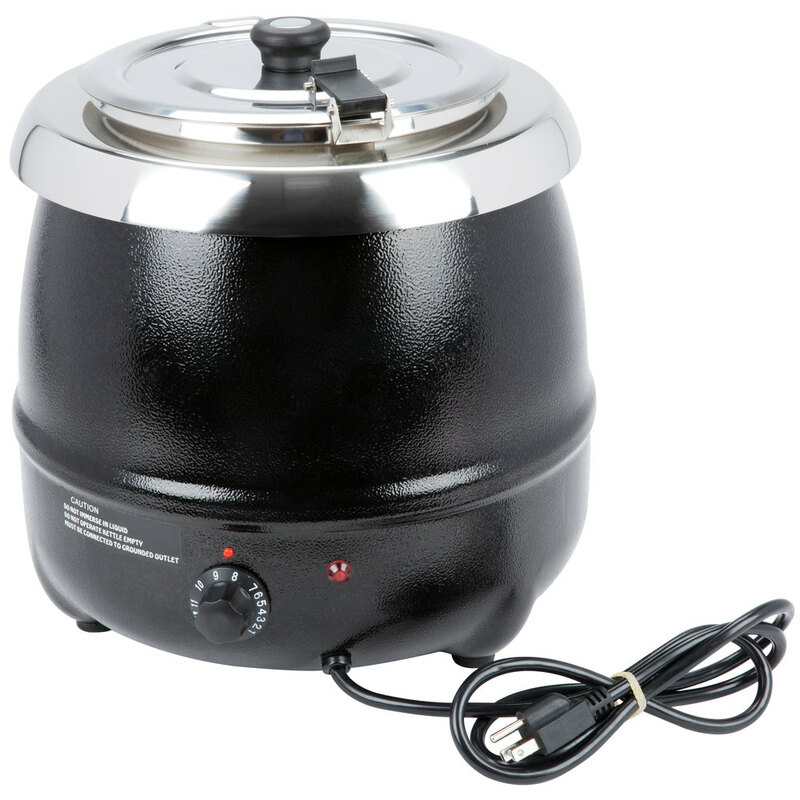 Round Black Countertop Food/Soup Kettle Warmer is perfect for serving soup! 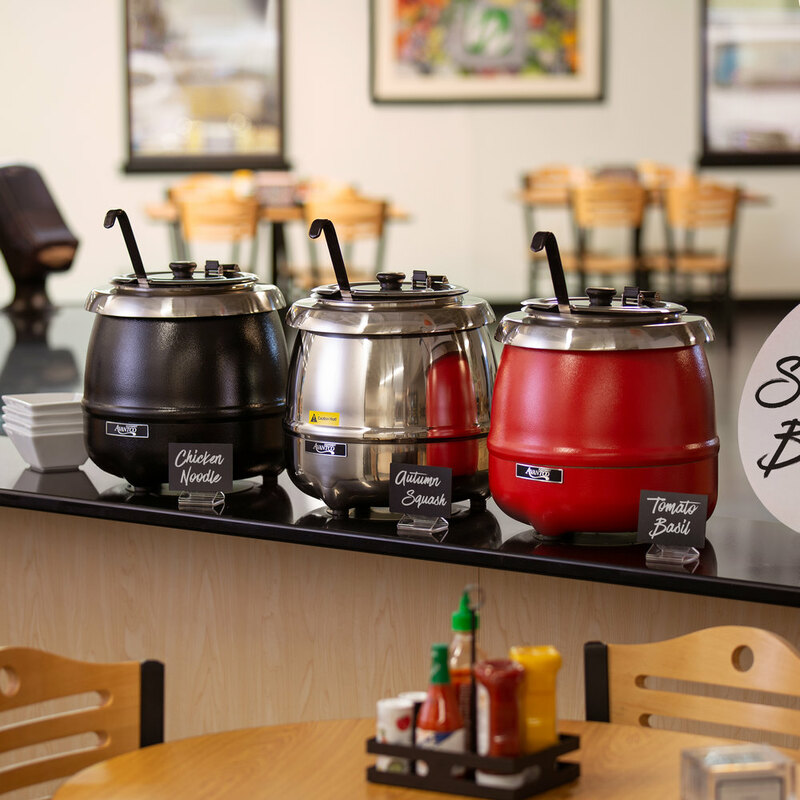 In our cafe, we keep the soup kettle behind the counter and serve our customers. 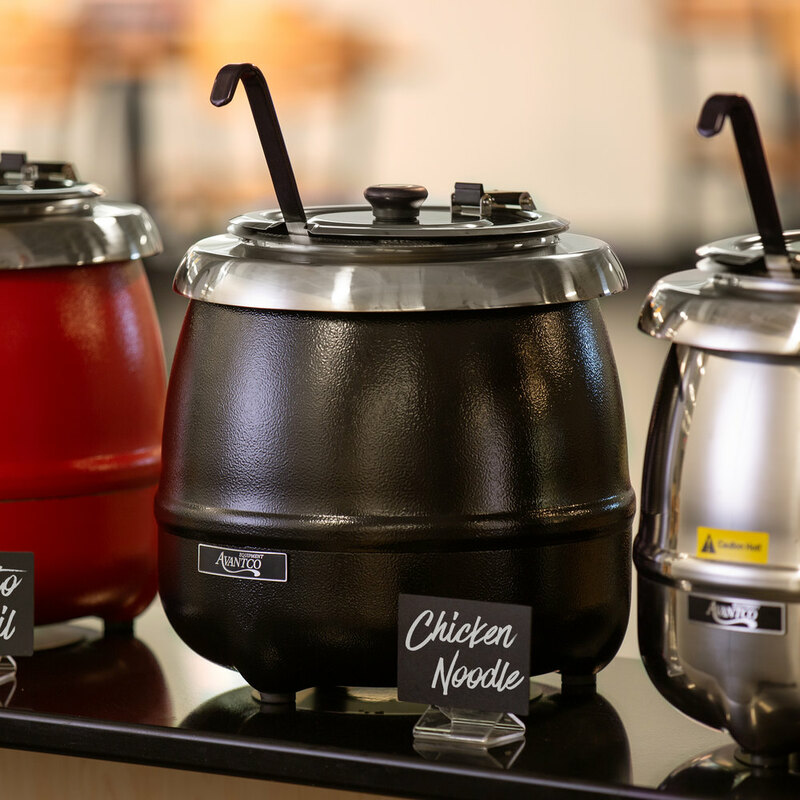 We have also taken these soups kettles to catering events, full-service and self-serve. They're great at heating soup without burning it, easy to serve from and easy to clean. When I'm transporting soup to an event, instead of the cover (which I still bring), I put tinfoil on top to prevent spills in the car. Oh my goodness! These are the cutest kettles EVER! They are very easy to use and warm up very quickly. The kettles will be used to serve soup at a winter wedding. Decent soup warmer (that we used for grits) but always had an issue with the lid coming off and not staying on tight. For the money it’s decent. As a soup focused restaurant, we needed these of course! We have at least 4 of them in use every day for 9-10 hours and they are work horses. We've had no problems at all. This soup pot is very cute. It keeps the soup warm. My only problem is the lid. I have the hardest time getting that to work correctly. Besides that, I love it. Excellent for keeping chili and soup warm. The temperature dial helps to find the perfect amount of heat with out burning. The design is compact and does not take up a lot of valuable counter space. A must-have in the cooler months! Fits perfectly in countertop. Keeps the soup of the day at the right temperature. Only issue is the water evaporation: there is no warning when out of water. The handler started to crack after few months usage. The store shipped us the replacement but the handler had the same problem after 1 month. Works great for our needs! This warmer keeps soup hot all day, perfect temp and no scorching.. Be sure to label soup from the bottom. We have three of these food warmers--love them! We have used them at catered events as well as in the shop for soups and curries. Very easy to operate, and very easy to clean up. A necessity if you need to keep food warm for longer periods of time. Great buy! This is a must have for any buisness owner, especially if you have paties. Very profesisionally made. I will continue to recomend this product to everyone..Especially if you are a small buisness owner. 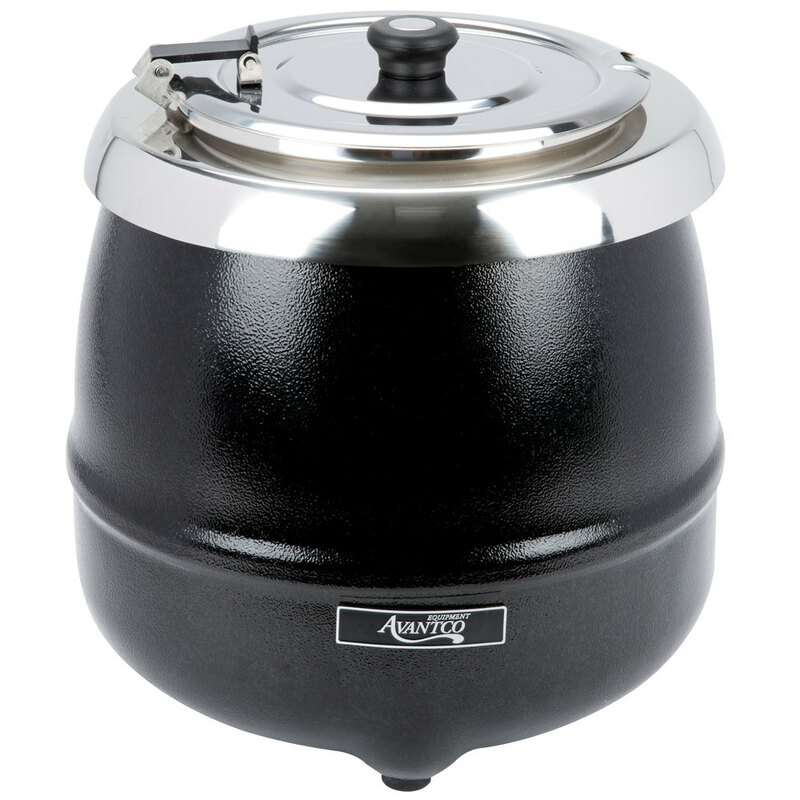 This Avantco soup kettle has made warming soup and finding a resource to serve it a breeze. We serve right out of the pot. The pot heats soup in no time and its very attractive. This has been a grand investment for our sandwich and soup venue. It is also easy to transport to our catering venues. We have two of these and they work great. 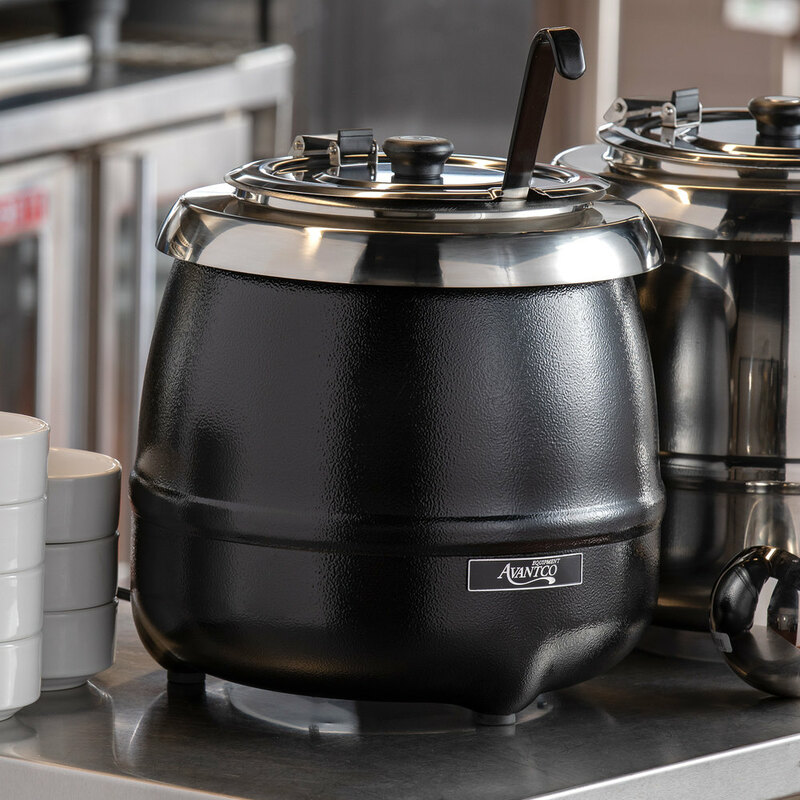 Our customers love the fact we now offer a soup and sandwich combo thanks to the addition of these kettles. So far, so good! Had this warmer for a few weeks and I think it is adequate. It is not a cooker and will not heat your soups and gravies to temperature, It is a holder and will hold temp as long as you heat the product first. I like the lid that attaches to the pot. I LOVE THIS KETTLE! IT IS A GOOD SIZE...IT IS 11 WHOLE QUARTS AND THAT IS .LARGE ENOUGH FOR MY HOBBIES, AND SMALL MANUFACTURING NEEDS. THANKS WEBRESTAURANT!! Hillary J. from Hijose, Inc.
Meh. This is just okay. It's pretty cheap and it feels cheap but it works to keep soup warm. It takes up a lot of space for what it does so we don't use it often. Bought this for meatballs and it is perfect. Keeps the meatballs the perfect temperature. This is perfect if you have a small space and need to keep soups or sauces warm. We originally purchased one of these units for soup serving. It was so nice and worked so well that we have since purchased two additional units that are the exact same. They are insulated very well and if we will be using these for a short event, like a lunch we don't typically even plug them in. We always fill the unit with already hot product and when doing so. this is a great soup pot for any operation where customers are intereacting or serving themselves the soup. Easy and safe to operate and clean. I bought this little soup kettle/ warmer because I was needing something for my nacho cheese that wasn't so intrusive and expensive. This warmer is perfect. I was looking for a large soup kettle for use during events. 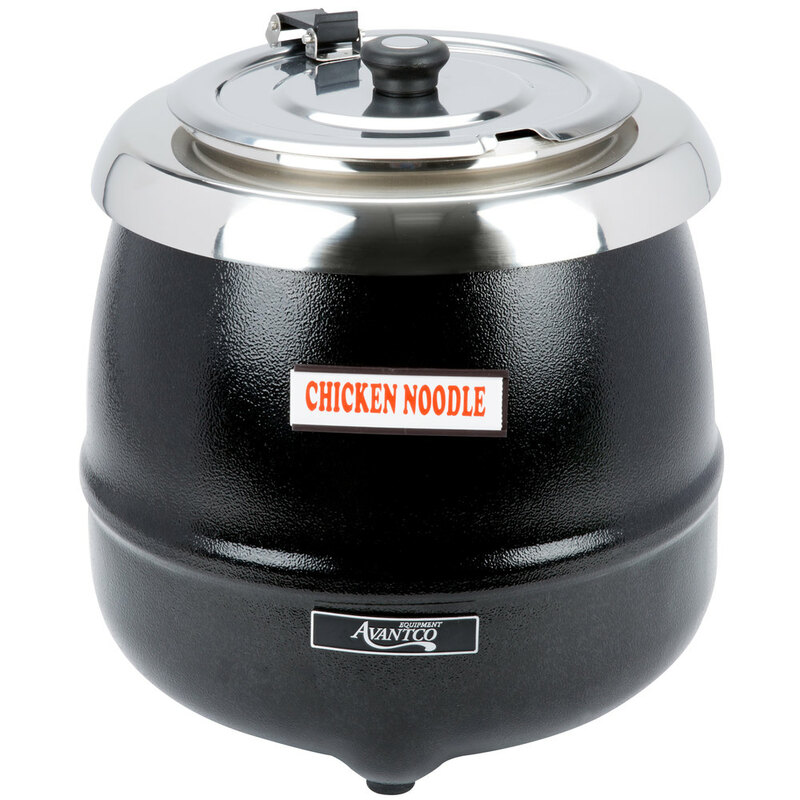 This 11 quart model holds a large quantity of soup or chili warm for service.